Has the caseload down at the VA ever included any paperwork for Captain Obvious? So on the left we have one Chad Fleming, a former soldier who served in the Army Rangers. And as you can see, he has a prosthetic left leg. He sought aid from the Department of Veterans Affairs because... well, you know, that's what they do for men and women who have been in the armed forces. But in order to determine if Chad was eligible for benefits, Veterans Affairs compelled him to get an x-ray taken of his left stump. This is what the VA required so as to discover if Chad Fleming was truly an amputee. 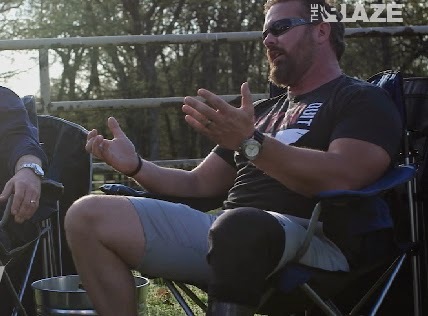 Chad Fleming, a veteran who served in the 75th Ranger Regiment, says the VA took an X-ray of his artificial leg to prove he was actually an amputee. Though they could have referenced his extensive medical history or just used their eyes, he said, they wasted precious resources taking an X-ray of a leg that "doesn't exist." "[The doctor] actually laughed," Fleming said. "And I told him, I said, 'You wonder why the country is in such a deficit? It's because you're wasting money taking X-rays of a leg that doesn't exist.' It's like, 'Dude I'm not a starfish. It isn't going to grow back.'" Another veteran in the story went in for a dental appointment, only to be told that he needed to make an appointment to make an appointment to see the dentist. I could make some snarky commentary about this and how it demonstrates how over-bureacratized and wasteful the government has become... but what would be the point of it? What good could come of it? Apologies to those I have come to know who work in the Department of Veterans Affairs. Each of you are doing an admirable job in spite of the conditions of not just your department but government in general. That being said: this kind of idiocy is irredeemable. The pennies do add up and in time things like this are an enormous strain on precious resources. I mean, really: how hard is it to look at a leg that isn't there? What about if we made the VA privatized? Have an outside company running it.